Surface Combat in the South Pacific, North Atlantic and the Mediterranian in 1939-1945. 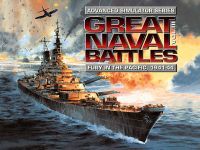 After the release of Great Naval Battles in the North Atlantic, four successors followed under the same Great Naval Battles label, but those games could only be called a huge disappointment after the original GNBNA. Why are all four games put together in one review - because there are only minor differences between them. They all use the same game engine, they only differ in scenario and have minor improvements added from version to version. 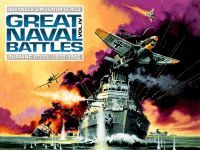 GNB2 - Guadalcanal is set in 1942 and 1943 and recreates the battles in the Solomon Islands between the USN and IJN. Its successor, GNB3 - Fury in the Pacific has the whole Pacific warfare as its scenario - from a hypothetical Plan Orange to the battles at the Marianas. GNB4 - Burning Steel returned to the scenario of the original GNBNA - the battles between the Kriegsmarine and the Royal Navy, together with the French, Italian and Russian fleets. The last game of the series - GNB5 - Demise of the Dreadnoughts was only included in the box Great Naval Battles - the Final Fury, which contained all games of the series plus GNBNA. It is set in World War I and includes all famous battles between the German Hochseeflotte and the Royal Navy. Each of the games has several scenarios that can be played from both sides, but although some of the longer scenarios are called "campaigns", there is no real campaign mode. Ships are controlled in Task Force, but can be released for independent actions - from which they cannot joined their task forces again however. In addition to the ship, the control of aircraft - land based and ship based - and a new strategic component in the game. Aircraft can either be used in patrol missions or to attack enemy task forces or bases. The bases are used to supply or repair ships and can be invaded by enemy forces. 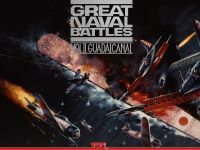 Unlike GNBNA, the other games do not differ between a battle mode and campaign mode - the game map can be zoomed from a complete overview to a single ship. This makes it possible that more than one battle can occur at the same time, with various task forces operating simultaneously, it is possible that two or more engage enemy formations at the same time. In the actual battle, several stations can be selected on the individual ships - navigation, primary guns, secondary guns, torpedoes, and damage control to name the most important. In addition several screens are available to control the complete task force. Up to two targets can be assigned to each ship - theoretically. In reality, the manual target selection does not work correctly in any of the games, so the frustrated player has to choose the auto target mode. With the more than stupid automatic damage control, you spend most of the time in the damage control screen to save your ships and for doing this you have to fight with the biggest enemy in the game - the user interface. Sooner or later a compound in the center of the ship will be penetrated by a hit - nothing against this. But when this compound is in the underwater section of the ship and none of the section above is damaged, one has to wonder if the shell has transit all decks through open trapdoors and makes a hole in the ship's floor to cause the flooding there. The user interface is one of the worst that could be found in a computer game. Especially during two or more simultaneous battles, it is impossible to switch between different ships fast enough to give orders in time. There are too much steps necessary to change from one station to another which decreases the pliability of the game quite much. During a battle the AI of the game is very weak. It is hard to explain what the AI tries to to do maneuver its ships, as the computer controlled ships tend to move into circles, loosing its formation sooner or later. It never occurred that the computer would send its destroyers for a torpedo run or to disengage its carriers to safe them in a surface combat. In short - battle engagements never seem do be realistic because of the computers behaviors. In addition, the problems of keeping the formations also belong to the human controlled ships, making it impossible to have a stable control over the ships. With GNB2 the graphics made the step from VGA (320 x 200) to SVGS (640 x 480). Although this should make the ships should look better, this is only archived partially. The side views of the ships are more detailed than those in GNBNA, but sadly many ships are too dark so many details get lost. And even worse, a bug in GNB4 displayed ships in a different direction - when heading away they looked as if they were heading towards the observer. The overhead views of several ships also look wrong, like those of the Bismarck class. The worst example for graphics is GNB5 - most ships look more like simple boxes and have almost no similarity to the original ones. Only those ships that could be reused from the previous games have the right look in this game. The sound in all games of the series is almost identical, the same gun fire and damage sound everywhere. A positive idea is the use of the original languages for messages reported to the player - the USN talks english, IJN Japanese, KM German and RIN Italian. But again, the realization if this idea is not very good - the used voices just sound extremely boring. All games play some music tracks in random order, this music is played form the CDs directly. GNB3-5 were delivered with a scenario editor which is able to build new scenarios form scratch or modify existing ones. This editor works quite good, and is not too difficult to use, only for big scenarios it will take some time to set up all the ships and formations. One problem that was never solved in the editors is the formation bug - when selecting a formation it can happen that all ships got stuck over another. To sum it sup - GNB2-5 had a good idea but the realization of those games is not so good. Instead of choosing the new game engine, it would have been a better idea to improve the existing engine of GNBNA. 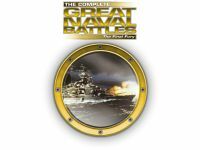 so it is not surprising that GNBNA is seen as the best game of the Great Naval Battles series by many people. The politics to sold GNB2-4 as single, full price games is also a point that could not be seen positive. In face, those are the same games with different scenarios - so a release as a scenario disk would have been a better idea.